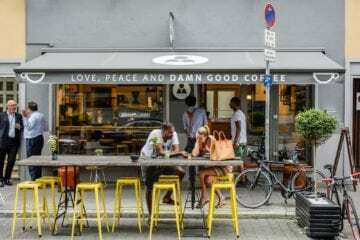 Just ranked as the most livable German city of 2018, Frankfurt offers a number of places serving speciality coffee. The coffee scene is constantly on a rise with a lot of room for growth. It is interesting to observe coffee professionals of Frankfurt make their way from an employee at a cafe to opening something of their own. In this article, you will find five successful examples of start-ups opened in the last nine months. 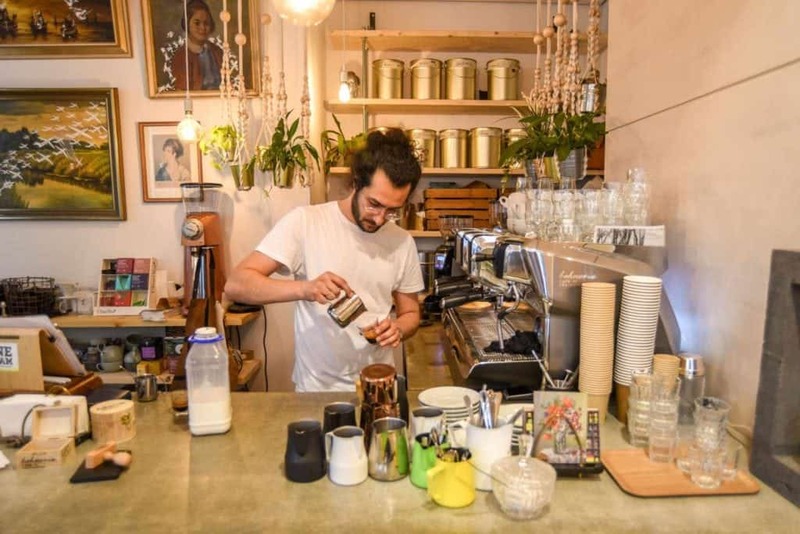 At the beginning of his career in coffee in 2013, Viktor Keil was employed at the famous Frankfurt roastery Hoppenworth & Ploch, which has been one of the key stepping stones for countless professional baristas in town. At Hoppenworth & Ploch, Viktor learned about the aroma and the sensory experience of speciality coffee, and he soon became an important member of the Matthias Hoppenworth and Julian Ploch team. After three years as a barista and roaster, Viktor started searching for possible locations to open up his own cafe. While working on this project, he made a barista appearance at The Holy Cross Brewing Society. Finally, after two years of ups and downs, he discussed his cafe idea with Michael Schaff, the owner of Tumult, in 2018. A cafe in a great location to escape from the city buzz, in the hip Bahnhofsviertel district. From then on, it went rather quickly in just a couple of weeks, as the infrastructure for a bar already existed at Tumult. 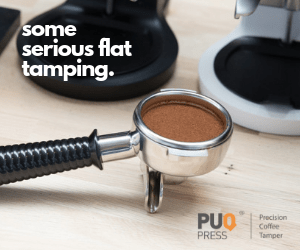 Viktor needed only to replace the existing coffee equipment with his own professional acquires, like the La Marzocco Linea Classic and some of the finest European speciality coffees and voilà: Tumult Café was born in April 2018. Although there were some doubts about the backyard-basement location of Tumult, they were quickly forgotten. The owners made sure to catch the attention of the passers-by. A wooden art installation on the street invites the guests to the cafe where everything is crafted in an artistic and creative manner. 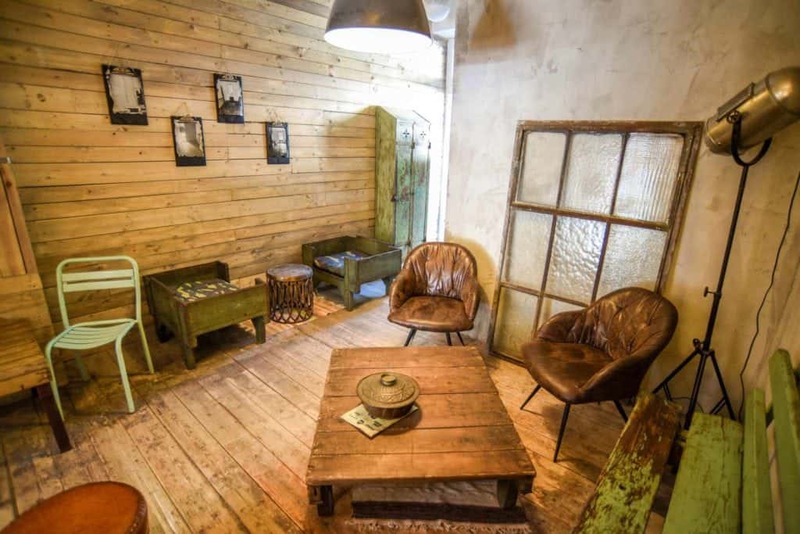 The place features a workshop for the furnishing of the various escape rooms—a game theme that is repeated throughout the cafe and its design. The cups come from a local pottery maker Viola Beuscher, who also holds pottery classes at Tumult. 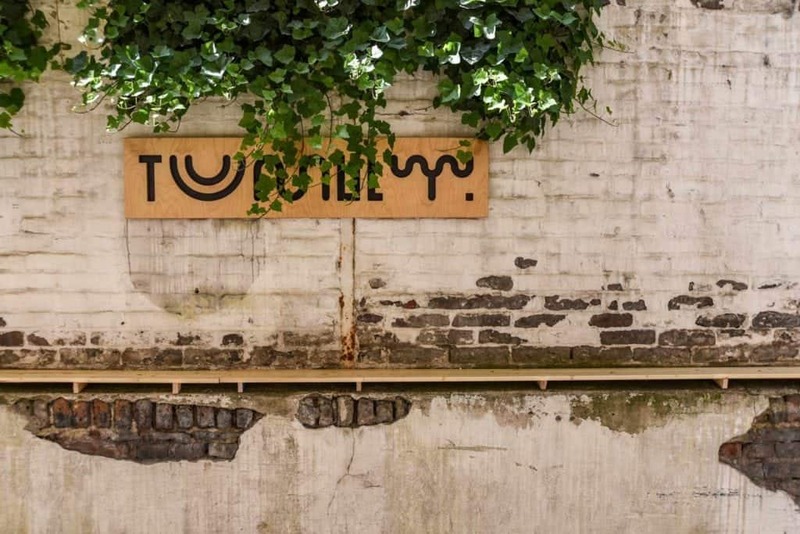 From the biggest eye-catching furniture to the tiniest details, everything is unconventional here at Tumult. For example, one can also pay by cryptocurrencies like Bitcoin. Viktor likes to surprise his guests with coffee that knocks them off their socks. Apart from the locally roasted, seasonal coffee by Hopplo, you will find a fruity option in the hopper of the Mahlkönig K30 Twin grinder. Regular customers can expect something new every four weeks and are even encouraged to bring their own recommendations. Recently, the Rocko Mountain by Good Karma Coffee was a great testament to what speciality espresso can taste like. The complexity of this natural processed Yirgacheffe, rich in floral flavours, fruity notes, and very sweet overall, was simply incredible. Likewise, the filter coffee range has got White Label’s beans on offer, for instance from Peru, and the fruity option changes regularly. At the moment, Fjord Coffee Roasters’ Ethiopian Chelelektu showed a beautiful aroma of citrus and orange, with an overall tea-like cup profile. All coffees were brewed on a V60 which grant consistent results. 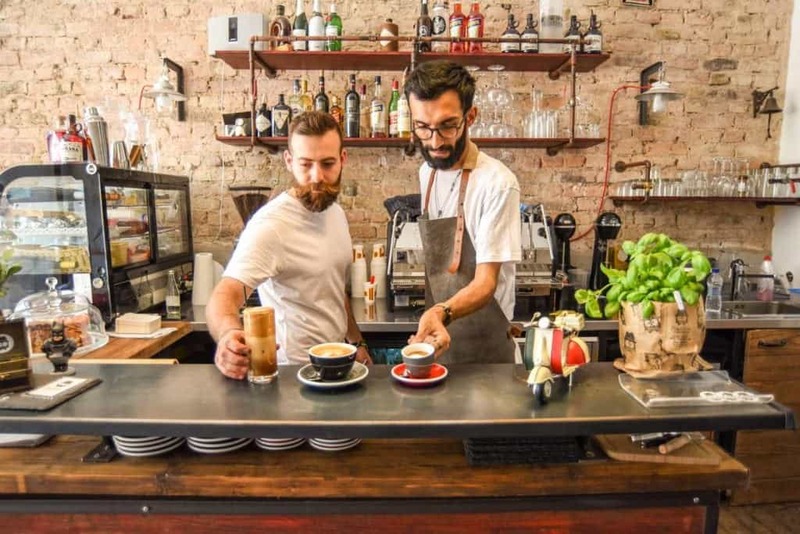 In just four months there have been The Underdog from Athens, Hard Beans from Poland, Father’s Coffee Roastery from Ostrava and Casino Mocca from Budapest featured on the menu. The list will continue, as the growing number of coffee lovers becomes to appreciate the extraordinary hospitality at Tumult. The cafe's set up is as versatile as their coffee menu. 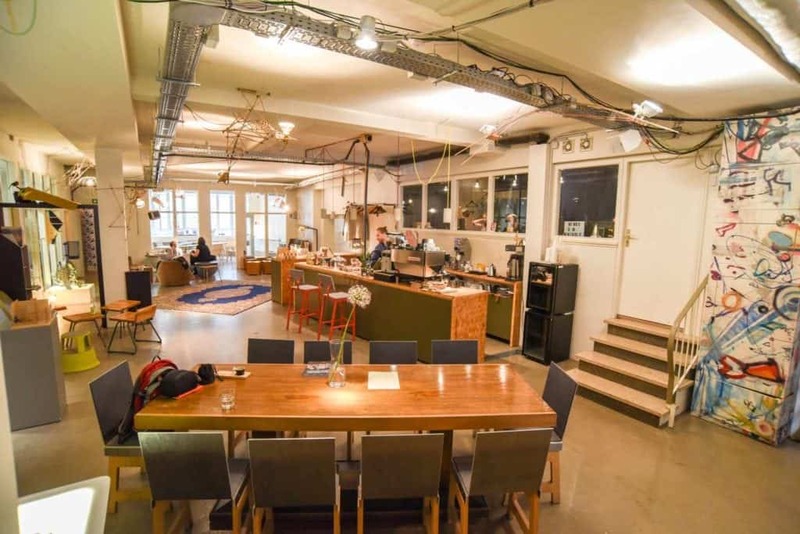 You can sit back and relax with your coffee in an upcycled bathtub sofa, or focus on work in a separate co-working space, play table-tennis, attend a yoga class, or even play one of the legendary escape games. The visitors who frequent the cafe the most are somewhere between 25 and 35 years old. They all come from a creative background and visit the cafe for the inspiring atmosphere. During the summer period, Affogato, Espresso Tonic, as well as cold brew widen the range of coffee drinks. 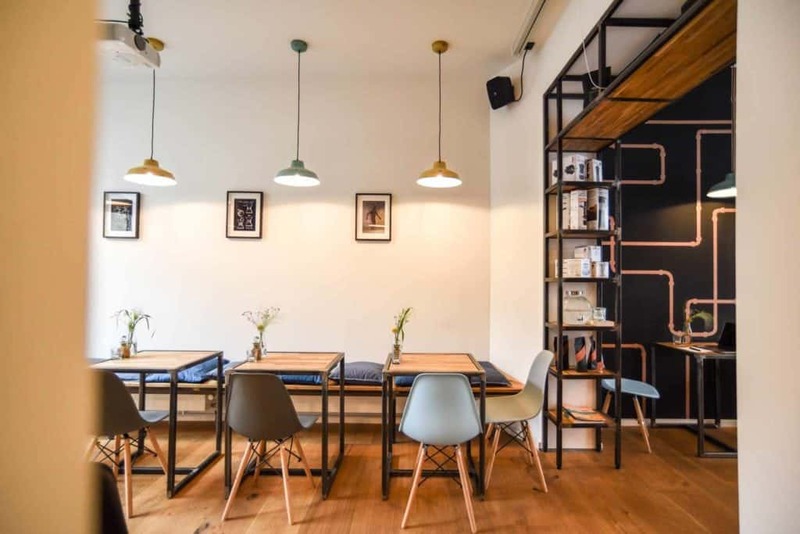 Tumult Cafe truly is one of the most sophisticated places in Frankfurt, providing a perfect product in an open-minded atmosphere. 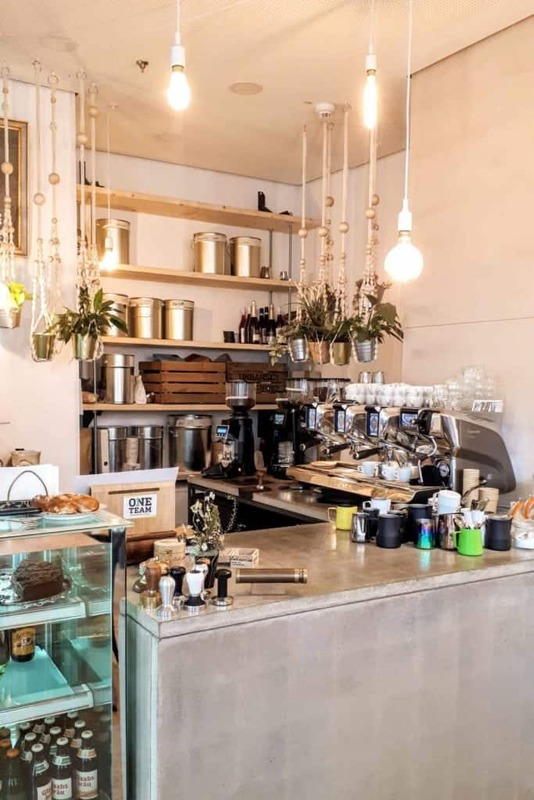 Located in the hip district of Bahnhofsviertel, near the railway station, Samson Habtom—who already successfully manages Bunca in Kirchnerstraße—opened his second cafe in May 2018, called Bunca 2.0. 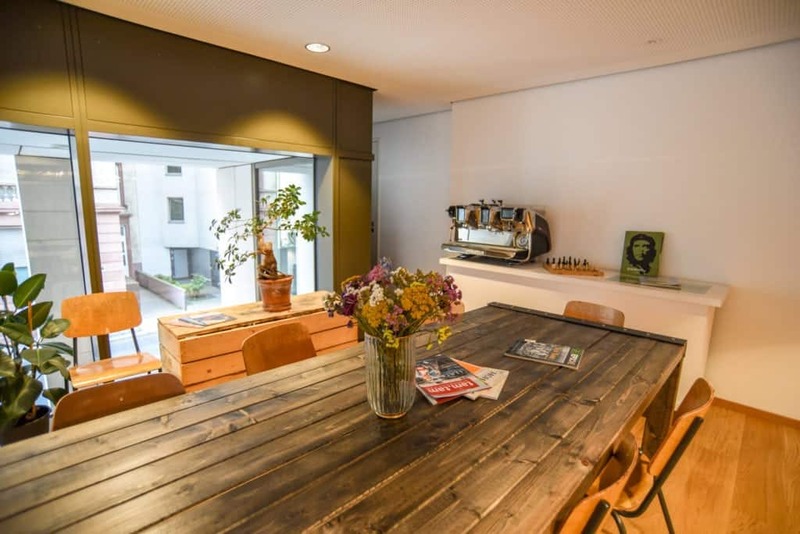 The new place offers him the opportunity to prepare food in a fully equipped large kitchen in the basement, in order to stay away from industrial products and to provide only homemade dishes, cakes and even lemonade. Bunca’s Banana Bread has made a name for itself already and is a must-try when checking out one of the two cafes. But there are also different lunch dishes for the hungry customers, and brunch options range from sweet to savoury. Nothing at Bunca 2.0 is left to chance. A very thought through, neatly furnished interior done in an industrial style in dark tones welcomes the visitor through a large glass front, keeping it bright on the inside. The huge bar features an eye-catching three-group San Remo Racer in the centre, alongside with two Mythos 1 grinders. Focussing more and more on travelling and visiting coffee farms, Samson delegates responsibilities to his team. Managing the new place and working as the head barista is Noah Habtom, who is in charge together with his co-workers in the kitchen and at the bar. 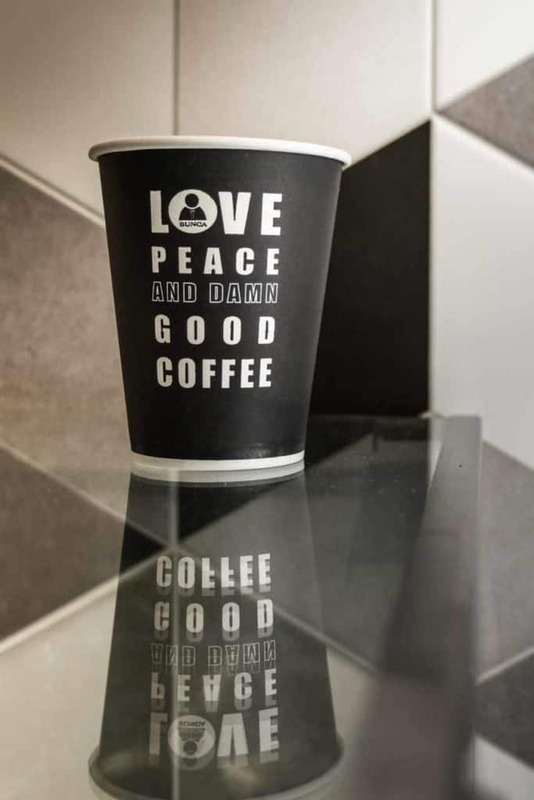 You will have a choice of two different espressos roasted by Lot Sixty One from Amsterdam, while the packaging is branded with the Bunca Logo. For the standard espresso, the FIVR is offered. A full-bodied, low-acidity, spicy natural-process Brazilian coffee with flavour notes of chocolate and orange fruitiness. The second option changes from time to time. Right now, it is the Bombora blend, a 50% Brasil and 50% Guatemala full-bodied, medium acidity, pulped natural Red Catuai and washed Caturra and Catuai. The blend tastes like caramel, cacao and has a silky mouthfeel. Filter Coffee brewed with a V60 is served on demand, also with a choice between two different styles, either a fruity one with a lighter mouthfeel or a chocolaty bean, a rather classic, heavier counterpart. Across the street from skyscrapers, this cafe experiences the classic rush times of the morning and lunchtime hours. On top of that, the cafe is full of visitors also during the evening hours, when it transfers from a coffee shop to a bar. Therefore, the San Remo Racer is mounted on a retractable table, so it disappears under the bar. Closing the curtains, extending the bar tables and dimming the light, Bunca 2.0 can be transformed into a fancy bar in a couple of minutes. Once a week, an after-work event takes place at the bar, hosted by one of the Bunca staff and two barkeepers from bars in Frankfurt. During the night, six different drinks are offered, with at least one including coffee, to showcase the versatility of this beverage. 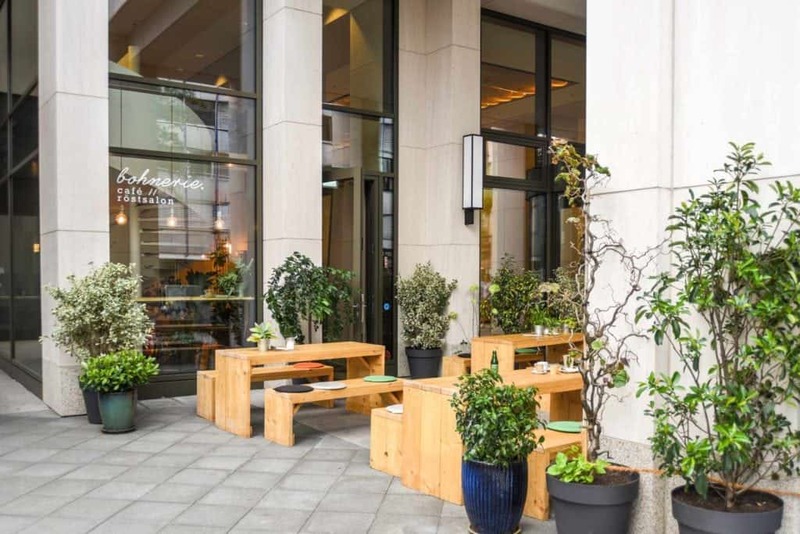 Located in a revitalised skyscraper in the southern part of Nordend, one of the most beautiful neighbourhoods of Frankfurt, near the city centre, this cosy place becomes your home away from home. The name Bohnerie can be associated with the French expression “Brasserie”—originally a name for a beer brewery, but nowadays describing an informal restaurant. 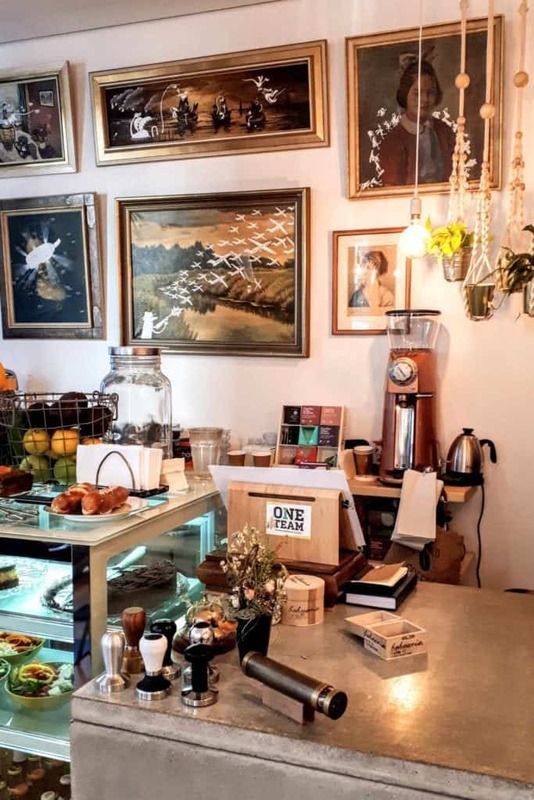 At Bohnerie, being freestyle and informal is the motto of the owner Rava Amin. So is his approach to roasting and working with coffee. Rava’s interest in coffee arose from the time spent in London and the vivid speciality coffee scene over there. Over time working with coffee became just a hobby done on top of his daily office job. He was given a lot of positive feedback though when serving coffee at events and at work. 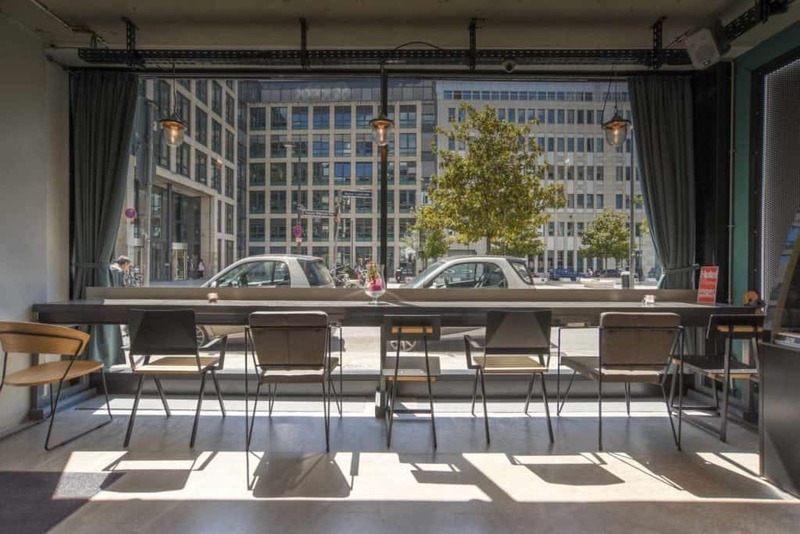 In 2015 the takeover of a small cafe project in Frankfurt marked his wish of starting up something on his own and finally, in December 2017, Bohnerie // Café Röstsalon was opened. Rava’s contact with Maren Ernst from Cologne or Thorsten Hahn from Good Karma Coffee in Karlsruhe provided him with a lot of know-how on roasting. Furthermore, the collaboration with the roasters gave him the opportunity to buy green beans from them in order to roast in his own style. While a third of his green bean supply is bought from his collaborators, the rest is bought from direct importers like Falcon, Nordic Approach and others. His fellow employee Eldana, born and raised in Ethiopia, started a project in her country of origin, based on her master studies of the botanies in Ethiopia. 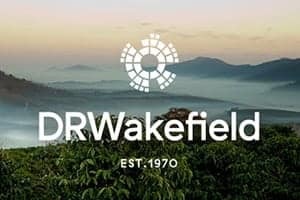 The plan is to facilitate contact between the roastery and the farmers, as they can support each other with in-depth knowledge about the finest coffees directly, such as some really rare Geishas. Every Sunday is a roasting day. 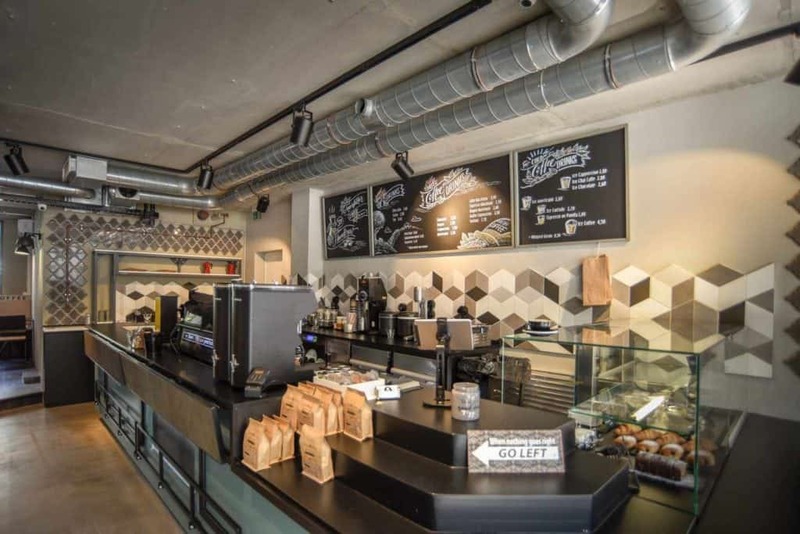 Thanks to a prototype roaster with an implemented electrical exhaust filter, Bohnerie is allowed to roast in this area of the city, usually out of reach for roasters with a regular exhaust system. Being open to everything available on the market, Bohnerie also roasts and serves some Robustas. Rava is convinced that always focussing on Arabica coffee species only is in contrast with the product itself. All coffees are handled with care so even the greatest speciality nerd shouldn't be afraid though! 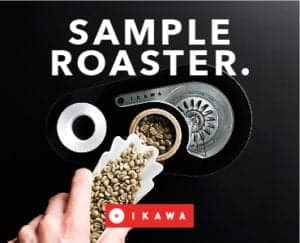 In regards to roasting, Rava also added: “Coffee is a natural product and it would be moronic to think it could be beaten by modern technology.” He emphasised he always has an artistic and intuitive approach towards roasting then. The coffee bar features a Faema line-up: Faema Ground Beakers grinder that serves two to four different espressos daily, all brewed on a Faema E71 coffee machine. Bohnerie’s coffee can be also purchased for home brewing. A few weeks ago, the house blend was of a light roast, with a hint of fruitiness. 70% of the blend was Arabica beans from Brasil, Guatemala and Ethiopia, and 30% was Robusta from Java. At least one single origin will always be available, such as the very light roast of Indian Monsooned Malabar, with a surprisingly soft, sweet mouthfeel and an elegant bittersweet aftertaste. Every time you visit Bohnerie, Rava and his team surprise you also with some pour-over filter coffee, always brewed on a V60. For example the Costa Rican honey-processed coffee, which had a characteristic aroma of melon, a soft mouthfeel and a citrusy aftertaste. 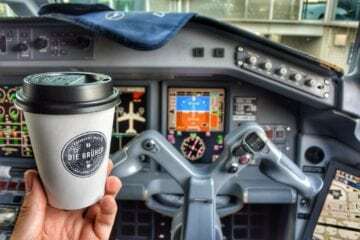 In roasting and brewing, Bohnerie aims for a distinct body of the cup, to excite a wider range of customers who are composed of students, families, as well as elderly people. Greeted with a handshake from Rava, everybody finds their favourite place. Some sit upstairs in a calm co-working area, others snag an outside hanging chair. 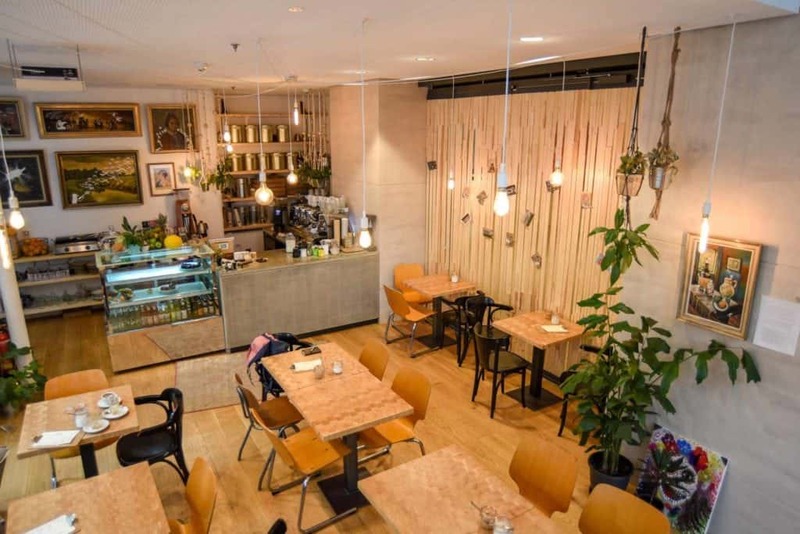 Sitting at a table, you can look around the carefully composed interior featuring changing art exhibitions. A local artist Sylvain Mérot is showcased here at the moment. Imagine a busy street with lots of special artisan shops and restaurants in a beautiful neighbourhood, but without a good coffee bar. Unbelievable to think that Oeder Weg, in the Nordend district, was exactly like that until May 2018, when KukuVaia The Bean Inspector came to the rescue. 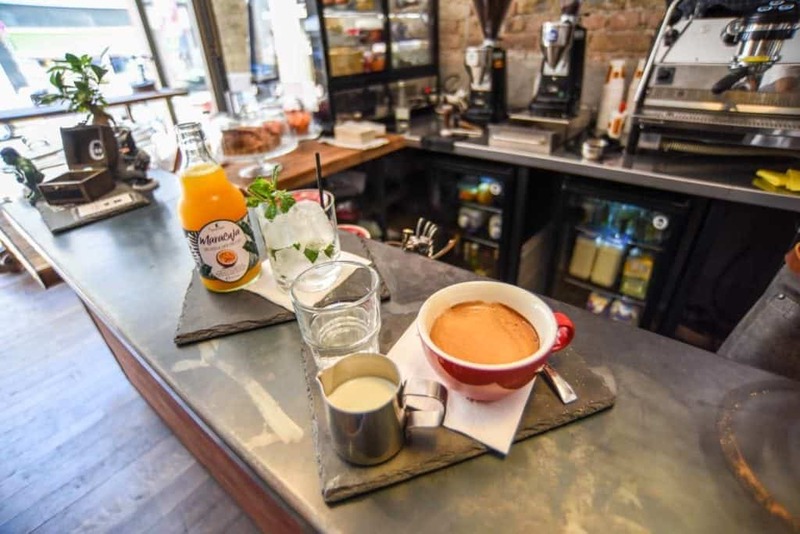 Nestor Dormanis, who is of Greek descendance, used to work in the kitchen of his parent’s restaurant in Frankfurt, managed their coffee bar and was on the road to coffee caterings. But he got the chance to show a sense of warm-hearted friendly hospitality at his own espresso bar instead. After ten months of waiting, reconstructing and furnishing, his project was finally ready to open in 2017 and gained attraction almost immediately. Some customers come over several times a day and many of them spend their after-work hours at KukuVaia, where the opening times extend until midnight every Thursday. Once a month, a DJ is on the decks and a small selection of aperitifs accompany the coffee menu. 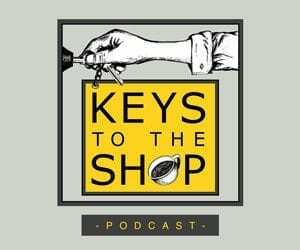 Because Nestor is at the beginning of his journey in the speciality coffee scene, he focuses on educating not only himself but also his team. The name ‘Kukuvaia’ means ‘an owl’, that is supposed to keep its eyes metaphorically open to find the best coffee, functioning as a ‘bean inspector’. 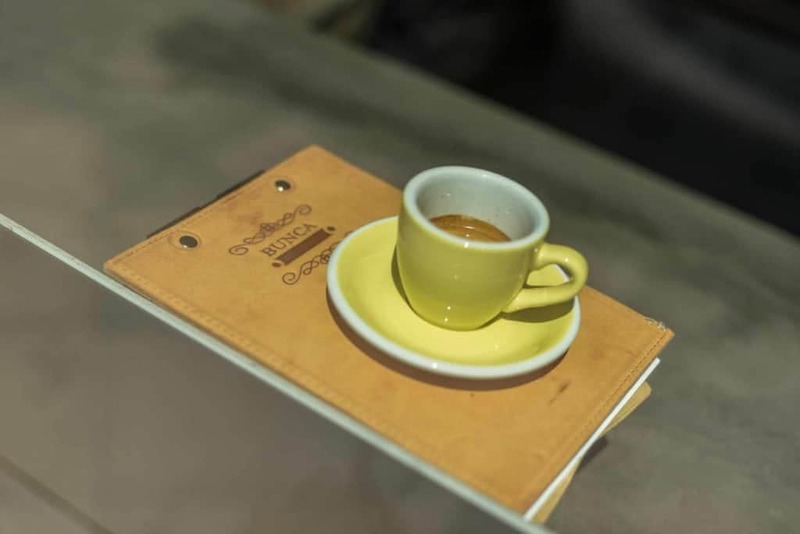 The first choice fell on the trusted Greece-based Dimello roastery to satisfy the walk-ins and classic-espresso lovers. The speciality coffee you will find at KukuVaia comes from the local Frankfurt roastery Hoppenworth & Ploch. Espressos with the Brasilian Guaxupé, a blend of Catuai and Mundo Novo varieties, are prepared on a LaMarzocco Strada AV and they work perfectly in milky beverages, resulting in caramel and chocolatey notes. Nestor is also regularly in contact with the team at Hopplo in order to figure out the future filter options for the cafe’s menu. With the help of a customised delivery bike, cold coffee drink orders including Frappé or Espresso Freddo can be brought to the customers at their hot offices. While constantly learning, Nestor and his team believe this new spot has got loads of potential. 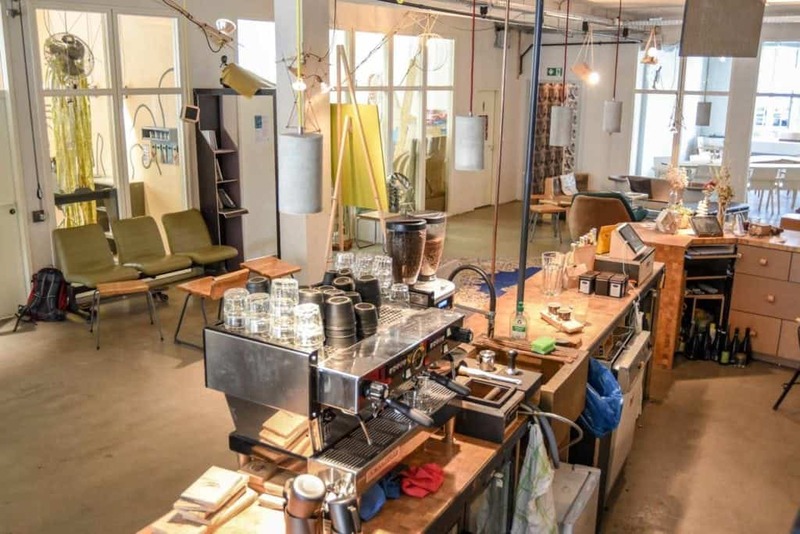 It already is a significant addition to the coffee scene in Frankfurt. You are invited for a quick chit chat at the bar, or to sit down in the intimate and cosy adjacent room which leads to a small green backyard. 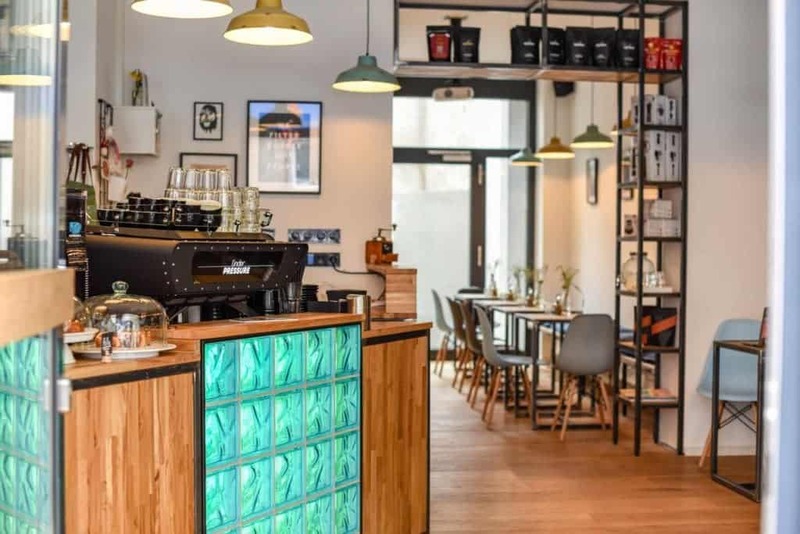 The latest addition to the map of speciality coffee spots in town is Sven Wörth’s Café Under Pressure, located in Sachsenhausen, on the southern side of the Main river. Sven Wörth, originally from Wiesbaden, used to work as a barkeeper in multiple countries like Australia and Canada. 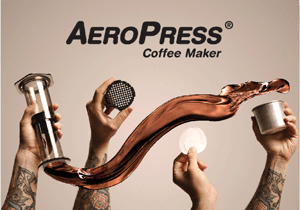 He first got in touch with the sophisticated preparation of coffee in 2010 at a barista academy in Munich. From then on a deep passion for coffee has developed. Sven even describes coffee to be more versatile and complex than cocktails. 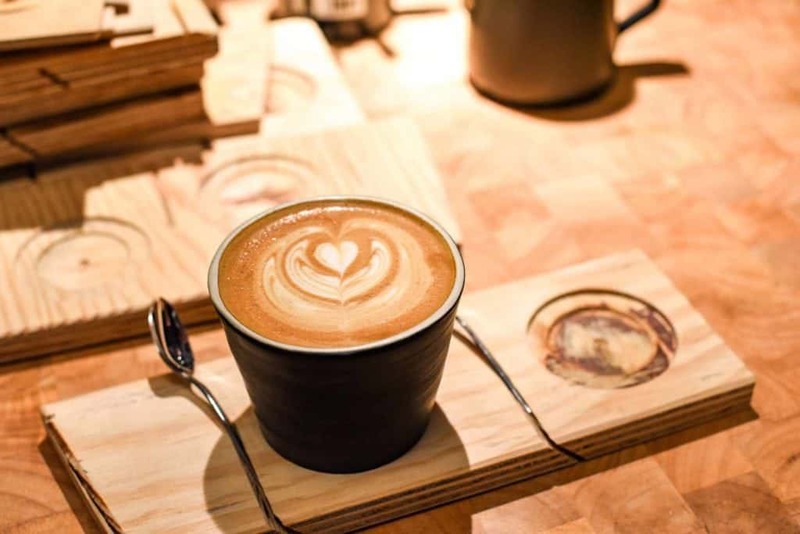 In contrast to mixing alcohol, where you work according to a prescribed recipe, every coffee, depending on the harvest, the origin and its individual taste is different and demands flexibility from the barista. 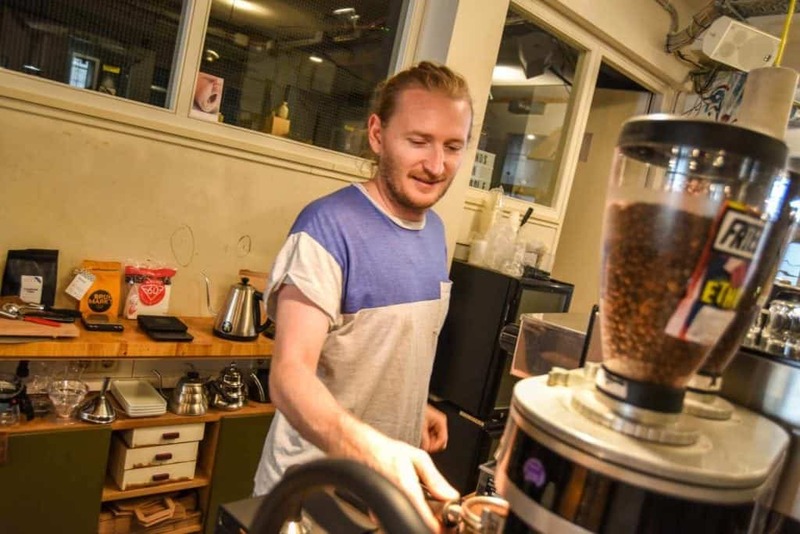 His idea of quitting his job as a barkeeper and focussing on coffee finally grew in 2014 when he succeeded 4th place at the German Barista Championship in Berlin. “Either you do it right or you don't do it at all” is his motto, recognizable in his love of the detail. 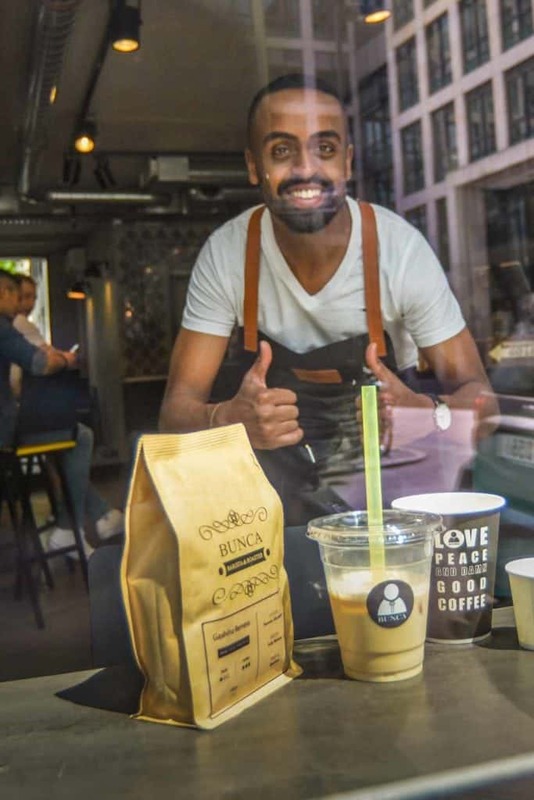 If you want to learn from his experience you are welcome to attend a barista course, following his credo of aiding and attending (“Bedienen und Beteiligen”) the customer. 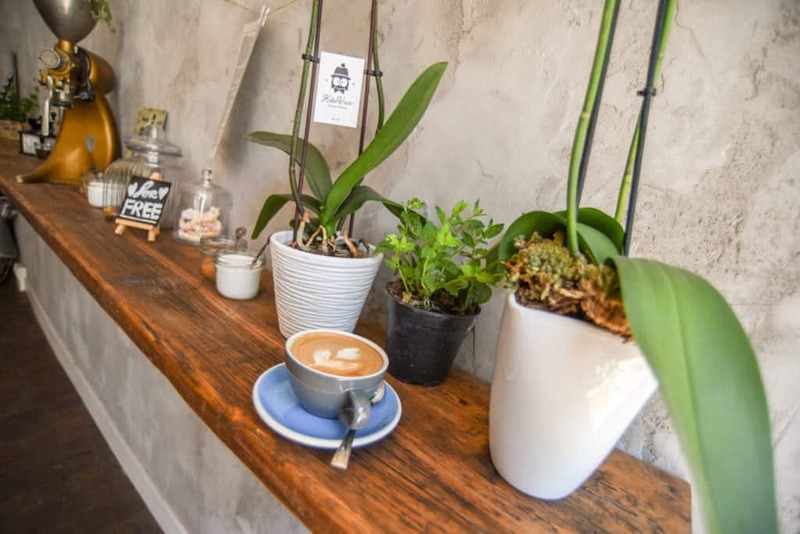 Three months of construction, 1000 kg of Oakwood, 500 kg of steel and 8 l of wood oil later, his cafe opened its doors in August 2018. Skilled craftsmanship, love for details and the inspiration by street art influenced the furnishing and the final look of the interior. It’s a pleasure to let the hands slide over the super smooth surface of the tables and the counter as a delicious cup of coffee is about to be served. 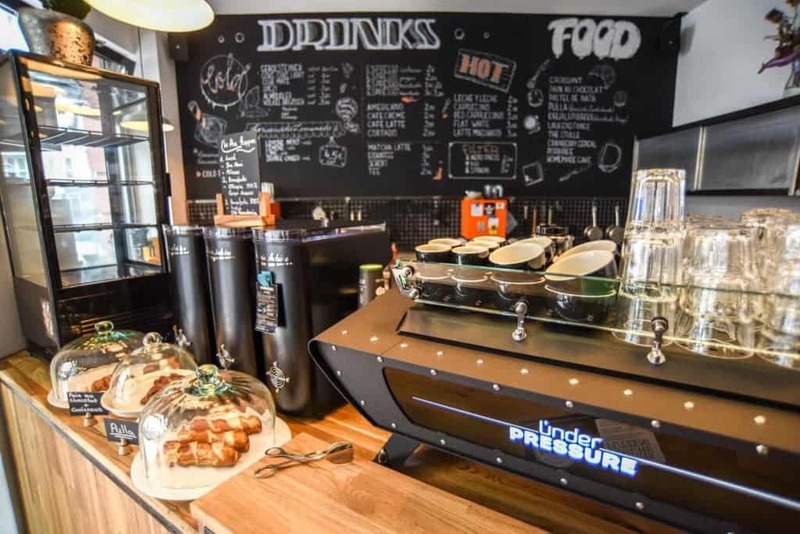 The coffee machine by Kees van der Westen, the Spirit Duette Idro-Matic, suggests you are in the right place for a good coffee. Early birds get their daily dose of caffeine from 7:30 am and may choose between three different espressos. One of them is a classic option by Frankfurt's roastery Caffè Due Mani, roasting multiple blends. 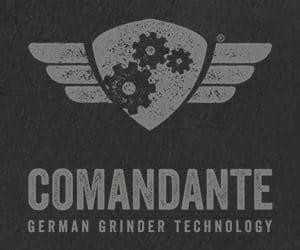 The other two Mythos 1 grinders hold coffee from Bonafede, the 2016 Crema Magazine–awarded roastery of the year. I had the choice between a 100% robusta Old Paradenia from India with its notes of caramel and tobacco contrary to that of the Ethiopian Gayo Amaro, best described as chocolaty with clear notes of wild berries and blueberry. Another eye-catching feature at Under Pressure is the two syphons at the large window front of the shop, rising attention of the customers. Filter coffee is also served using AeroPress or V60, but as the Syphon method is rather seldom I went for this option. The brew of the Ethiopian Yirgacheffe Chelelektu, from Caffè Due Mani, was floral and sweet, with citric acidity, red-fruit aroma and a light body. 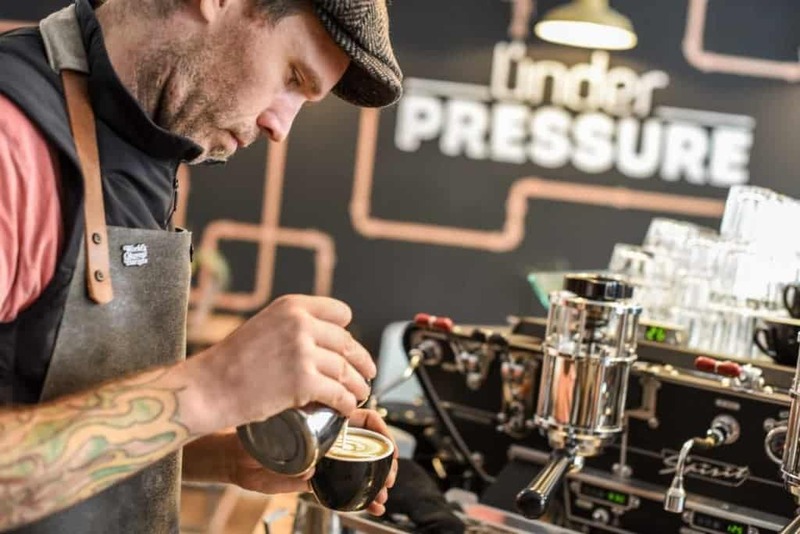 Soon, Under Pressure is going to offer coffee roasted by Kaffa roastery in Helsinki. Sven still offers a Cascara of the Costa Rican Catuai cherries from Kaffeekirsche roastery in Berlin, of which he bought the very last 48 kg. Typical pastries from Finland like Pulla (crumpet) or Karjalanpiirakka (Karelian pasty) are a good addition to the food menu. 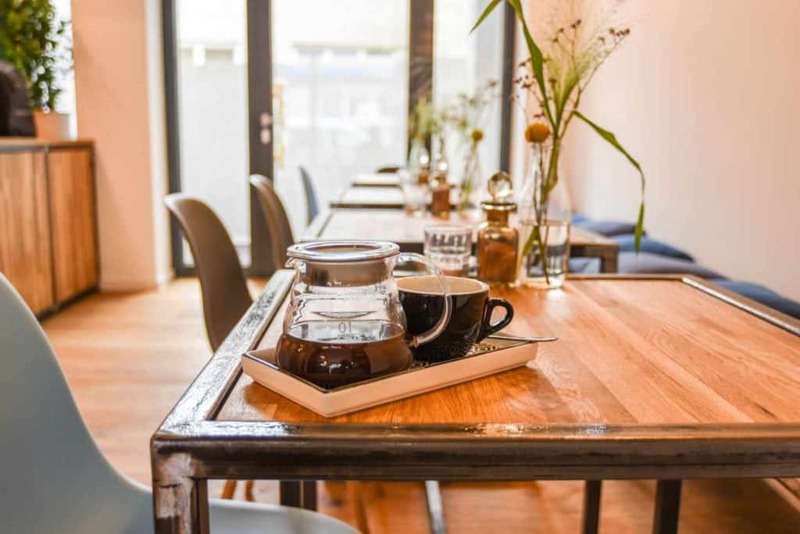 Every cafe among the latest additions on the map of Frankfurt has its own special way of working with coffee and offering different experiences. It never gets boring in the most livable German city of 2018. Alexander Kutschmann works as a pilot for Lufthansa CityLine based in Frankfurt, Germany, serving destinations across Europe on the Bombardier Canadair Jet. 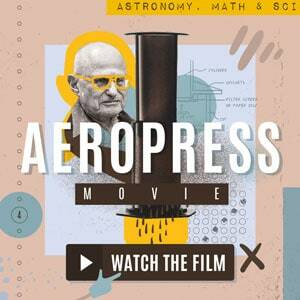 He shares his European discoveries, photographs of aviation, travelling, and coffee on his website and Instagram.